wetland regulation and private property rights. A prominent legal scholar and wetlands expert, professor Royal C. Gardner has a rare knack for describing landmark cases and key statutes with uncommon clarity and even humor. Students of environmental law and policy and natural resource professionals will gain the thorough understanding of administrative law needed to navigate wetlands policy-and they may even enjoy it. "...if a normal law book is like eating your brussels sprouts, this book is guacamole funny. Mr. Gardner has a light tone and peppers the book with humorous illustrations and anecdotes, while sneaking in nutritious law and policy. ... 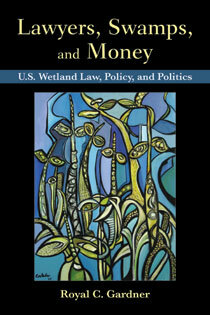 So in short, you should buy this book if you are: a U.S. wetland regulator, policy-maker, lawyer, banker, in-lieu fee provider, researcher, or consultant." "Lawyers, Swamps, and Money explains the importance of America's wetlands and the threats they face, and examines the evolution of federal law, principally the Clean Water Act, designed to protect them. Royal Gardner's writing is simultaneously substantive and accessible to a wide audience—from policy makers to students to citizen activists." "Swamps seldom are an engaging topic of conversation, let alone of a book. Lawyers, Swamps, and Money is the exception....Overall, the book is an excellent addition for collections on law, public policy, and the environment." "For a legal lesson, the book is surprisingly readable. Gardner sprinkles it with swamp humor and insights—from Shakespeare to Gary Larson. In conclusion, Gardner comes across as an optimist, proposing a laundry list of reforms to lead regulators and administrators out of the, er, swamp of wetlands management." "Gardner, unquestionably one of the nation's leading experts on wetland law and policy, has provided something for everyone interested in the field. Lawyers, Swamps, and Money will serve as an invaluable primer for students and others just entering the mystifying world of wetlands, and it is also chock full of insights and information that will add to any expert's appreciation and understanding." "With a clear, logical, and humorous style, Gardner describes the antics of land owners, regulators, and justices—all of which would be funnier if they weren't true and if the stakes were not so high. Those who want to understand why we don't have clean water, and all who want to correct the problems, need to begin by reading this book!" "Want to be entertained reading about wetlands law? Written with wit and solid research, Roy Gardner has converted the complex legal history of federal wetlands law into a delightful, good read." "Lawyers, Swamps, and Money pulls off several neat tricks: It not only threads a clear path through the present complexity of wetlands protection law while thoughtfully charting important national win-win strategies for the future, but it also does so in a style that is helpful for both citizen activists and environmental attorneys." "In conclusion, Lawyers, Swamps, and Money is both comprehensive and complete. Professor Gardner brings to bear his considerable experience in wetland law to create a book that is both concise and refreshing in its treatment of the issues at hand. Throughout the book, Gardner's humor adds a pleasant touch that keeps the reader turning the pages. In the end, the reader is left with a strong impression that wetland policy is in need of change; just how to implement that change in the face of economic and environmental pressures is the intellectual challenge. In short, this book is a must read for anyone interested in learning about or hoping to change wetland policy in the United States." Chapter 3. What's a Wetland (For Purposes of Clean Water Act Jurisdiction)? Chapter 8. In-Lieu Fee Mitigation: Money for Nothing?